ACT vs. SAT Which One Should I Take? Students often struggle with deciding which test is better for them to take ACT or SAT. This article analyzes some key differences between the ACT and the SAT. Hopefully this will help you make your decision. ACT is a popular choice in the Midwest, South and Northern part of America. Writing section on the ACT is optional and does not influence the calculation of the core scoring. ACT is scored out of 36 points and the overall score reflects 4 section excluding the writing. ACT scores writing separately. ACT requires a faster pace. ACT has a science section. ACT does not penalize the student for guessing. No points are deducted from the overall score for being wrong. ACT has more advanced topics such as basic Trigonometry, sins and cosines, and Logs. But all of the questions are in multiple choice format. So if you don’t know you can guess. ACT has questions asked in a straight forward manner. They are not tricky. 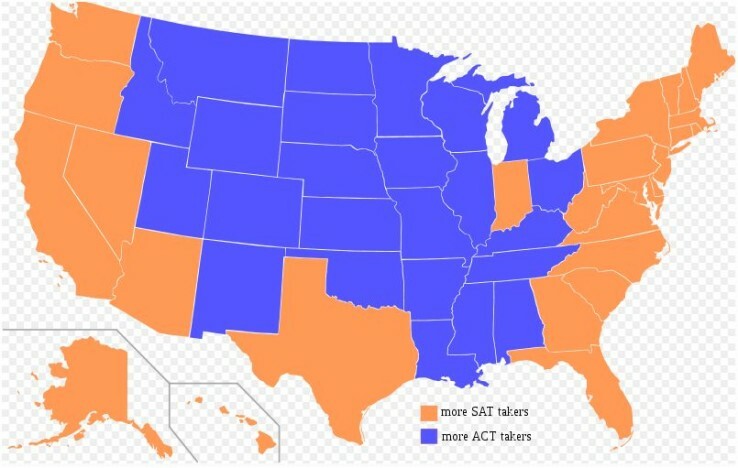 SAT is a popular choice on the east and west coasts. SAT consists of 10 sections: Math, Reading, Writing and an experimental section which is either a reading or a math. Writing section is required and does influence the calculation of the core scoring. SAT is scored out of 2400 points and the overall score reflects all of the sections including writing. SAT is generally a slower pace test compared to the ACT. SAT does not have a science section. SAT penalizes the student for guessing. ¼ or quarter points are deducted from the overall score for being wrong on each question. SAT does not have more advanced topics however, it has 10 free response questions in which students have to numerically grid in the answer with no multiple choice. The decision of which one is better depends on the student. It is recommended that students are weak in English but stronger in Math and Sciences should take the ACT because it favors them by having the writing section optional. Students who are great with English language should use their skills to master the SAT as it has several sections with writing and reading involved. Always look at the University you are applying to because some will take one over the other and some will take both. Phoenix Tutoring & Test Prep provides one-on-one Test Preparations in person for those in Phoenix, Chandler, Gilbert, Scottsdale, Mesa, and Paradise Valley. We also offer one-on-one ACT and SAT tutoring and test preparations online over Skype to students all over United States and Canada. To purchase lessons with us please visit www.phxtutoring.com.